Why Can't NYC Fix Its Deadly Bike-Lane Problem? It was just before 7am on a sunny Tuesday morning in June 2016 when the ambulance arrived for the body. Leah Sylvain, a 27 year-old Brooklyn resident, was riding her bike northbound in the bike lane of Bushwick’s Evergreen Ave when the driver of a fuel truck traveling the same direction swung into her right-of-way. His truck struck her, and her head struck the pavement. By the time the ambulance reached the hospital, Leah Sylvain was dead. It was the city’s fifth cyclist fatality of the year (the total has since climbed to 15; last year at this time, the New York Times and others had tallied 11), and there’s no reason to expect these bloody deaths to stop. Bike deaths tend to be gruesome incidents, given the weight and speed differences between a cyclist and a moving vehicle. But fatalities like Sylvain’s are also largely preventable incidents. And prevention starts with the design of the streets themselves. It’s not that the city’s cycling acumen hasn’t made any progress. In the last 10 years, NYC has built over 500 miles of new bike lanes. The city’s head count of daily cyclists is up around 70%, and the Citi Bike program is adding outer-borough locations this year. But New York City desperately needs more bike-lane infrastructure, especially protected bike lanes, which separate cyclists & pedestrians from traffic by a physical barricade, and can be up to 90% safer than the unprotected lane Sylvain was killed in. Better, smarter bike-lane infrastructure can directly save the lives of New York’s 780,000 regular bike riders. (Full disclosure: I’m one of ‘em. I frequently ride my bike in Brooklyn and Manhattan for commuting and leisure.) Indirectly, it could reduce car congestion, thin ridership on overcrowded subways, boost street-level commerce, and improve access to affordable inter- and intra-borough transit. So, why don’t we have more of it? The long answer is that New York City’s street redesign efforts are mired in a morass of competing agendas: pedestrian safety, private property ownership, public redevelopment, political horse-trading, and apprehensions about gentrification’s pitiless march. But there’s a shorter answer, too: parking. Protected bike lanes, with their dividers and buffers, require some road space. Because “we’re not in the business of knocking down buildings to widen roads,” says Caroline Samponaro, Deputy Director of Transportation Alternatives, in a phone interview with Thrillist, pavement is a zero-sum game in NYC. To install a protected lane, a modest amount of parking must be reallotted. The Lafayette St and 4th Ave protected lane, for example, spans 15 northbound blocks, and required the NYC DOT to reappropriate 25 parking spots (of around 230) when installing it in 2014. Almost 90% of that corridor retained curbside access. If you’re in the 60% of city residents who don’t own cars, those numbers probably sound pretty good. A couple of parking spots per block in exchange for fewer dead cyclists and pedestrians? No-brainer! But for the 3.3 million New Yorkers who drive, and the nearly 1 million non-residents who commute into the city by car each day, it’s not that simple. Better, smarter bike-lane infrastructure can directly save the lives of New York’s 780,000 regular bike riders. And so, parking is a consistent rallying cry in the battle against bike lanes. “People are battling it out [against new bike lanes] to save a parking spot here and there,” observed Samponaro. “That speaks to priorities. That has to change, if safety is a priority.” It also has to change if New Yorkers ever hope to have a properly funded transit infrastructure; around 98% of the city’s roughly 4 million spots are free, meaning miles and miles of public property are being given away to car-owners while the rest of us sweat it out on the subway or risk riding on under-protected lanes. A watershed moment came in 2007, when Mayor Bloomberg appointed Janette Sadik-Khan as NYC DOT Commissioner. Under Sadik-Khan, the department began aggressively rearranging the city’s streets, with an emphasis on implementing the 1997 NYC Biking Master Plan. Quick history lesson: New York’s transit infrastructure was overwhelmingly car-centric through most of the 20th century, thanks in no small part to the three-decade reign of infamous auto-phile and controversial urban planner Robert Moses. But since 1990, NYC’s general population has swelled 16%, according to recent US Census estimates, while annual MTA ridership is up over 40% in the same period. More and more New Yorkers sought transit alternatives to traffic jams and crowded trains. Bikes were an obvious choice. Since the beginning of the '90s, bike ridership has been up around 320%. The explosive growth created an increased demand for redesigned street spaces, while mounting evidence suggested free parking was little more than a public subsidy to private car owners. All the while, cyclists kept getting killed. 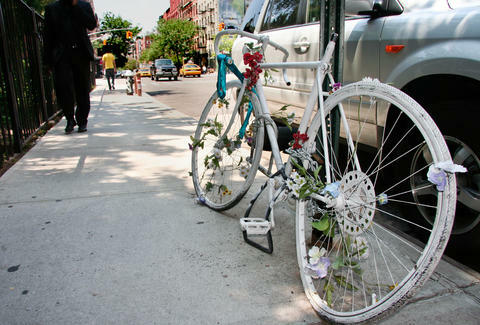 The city’s fatality count hovered between 18-24 cyclists each year for the first half of the '00s. Something had to give. Parking is a consistent rallying cry in the battle against bike lanes. Enter Sadik-Khan. Under her watch, NYC put in 35 miles of protected lanes, which at the time represented a third of all protected bike lane mileage nationwide. Several crucial intra-borough protected lanes, like those on Kent Ave in Williamsburg and 9th Ave in Manhattan, were installed under her tenure. Daily bike trips, in turn, skyrocketed from 210,000 in 2007 to 380,000 in 2013, Sadik-Khan’s last year in office. New Yorkers could see that if they rode in those lanes, they’d be shielded from moving vehicles. When biking no longer felt or looked like a suicide mission, more people began doing it. Not everyone was pleased. Critics bemoaned the changes as elitist, undemocratic, and European. They claimed lanes would cause more traffic, more crashes, and more deaths. (All statistically false.) And what about the parking spots? The data from test cases overwhelmingly favors protected bike lanes as a positive road feature for all road users: rich or poor, walking, riding, or even driving. But numbers are no match against headlines like “The bike-lane cancer” and “Are urban bicyclists just elite snobs?” Public opinion is a fickle beast led by loud voices, and Sadik-Khan’s changes to the city streets were loudly decried by its car drivers… and the politicians who wanted their votes. “Politicians learned the lesson,” wrote Sadik-Khan in a March 2016 opinion piece in New York Magazine. “Bikes were bad politics.” (Through a representative, the former commissioner declined to comment to Thrillist about her time in office.) “I’d imagine that if you were a politician, and you walked into a room where a couple hundred people are screaming about a bike lane, you’re not going to jump up to take a contrary opinion,” joked Doug Gordon, founder of bike advocacy blog Brooklyn Spoke. The political theater that bike lanes inspired in NYC, on the other hand, was first-rate. Take, for example, the battle for Prospect Park West. In 2009, the NYC DOT presented a plan to reduce speeding on the road by installing a 1.8-mile, two-way lane protected by a “floating” lane of parked cars. The project was approved by a community board vote of 18-9, and completed in June 2010. (Twenty-two parking spots got reappropriated over 19 blocks, though the NYC DOT told the New York Times in 2011 that 16 had been reinstated.) Then the opponents -- a small cadre of residents calling themselves Seniors for Safety and Neighbors for Better Bike Lanes -- sued the city, and the fun really began. The lawsuit was backed by a roster of political heavyweights who lived in the neighborhood and claimed the lane was destroying its character as a city landmark. Iris Weinshall, Sadik-Khan’s predecessor at the NYC DOT and the wife of Senator Chuck Schumer, was involved. So was Marty Markowitz, Brooklyn’s colorful one-time Borough President; Louise Hainline, the former dean of Brooklyn College; and Randy Mastro and Norman Steisel, both former NYC deputy mayors. These high-profile Prospect Park West residents used their political and community influence with such frequency in the lead-up to the suit that StreetsBlog, a national safe-streets advocacy publication, actually built an entire six-part investigative series on the matter off of some well-aimed FOIA requests. The entire thing is worth a read -- from the emails Weinshall & Steisel exchanged about using their clout to get a resident’s anti-bike lane op-ed published in the New York Times, to Hainline’s outlining a plan to “flip” a city councilman’s position on the lane by offering him access to Senator Schumer. For a year, the merits of the Prospect Park West protected lane were a matter of opinion. Some powerful people clearly held strong negative opinions. But in January 2011, the data rolled in: crashes down 16%, crashes with injuries down 63%, speeding down 55%... the lane was a categorical success. And the lawsuit? After being thrown out in 2011 on the statute of limitations, it was reinstated by an appeals court in early 2016. Meaning that after a solid half-decade of safer streets and less speeding, there are still some folks in Park Slope who want to tear out that bike lane. Why? This brings us back to community boards. Bike-lane battles in NYC are certainly about parking spots, but they’re also about control -- control over the rate of change that a neighborhood undergoes, and the characteristics of that change. Look at the recent flare-up at Clinton Hill’s Community Board 2 over the NYC DOT’s Clinton Ave street redesign proposal. The plan was ambitious: change the two-way street to northbound traffic only to throttle the frequent speeding (NYC DOT found up to 24% of northbound vehicles over the speed limit), then install a two-way protected bike lane stretching from the rapidly developing Navy Yard down to Atlantic Ave, to facilitate access and reduce the number of cyclists using the avenue’s broad sidewalks. And it had community support: an online survey of 1000 people (75% of which were residents of CB2) had shown 64% support for the DOT’s proposal. So a meeting was scheduled for May 2016 to discuss the project. That meeting got ugly quick, and stayed that way. Gothamist reported that almost 300 residents came out, “the majority of whom appeared to be against” the bike lane. This turnout was so much higher than normal that after a three-hour meeting, there remained almost 70 people waiting to speak before the board. Two nights later, CB2 called a spillover session, which I attended. To view cycling in NYC as a conspicuous affectation of young, educated, upper-middle-class New Yorkers is to sell it short. Beneath the parking gripes and political favoritism that countenance bike-lane opposition in NYC lurks a fundamental anxiety about gentrification. From afar, it’s easy to see why. Bike lanes are physical changes to the streets, and they promise to bring new faces to the neighborhood: tattooed 20-somethings cruising Williamsburg on single speeds, finance bros cutting up the East Village on Citi Bikes, aggro dads riding their pricey racers to Prospect Park… Et cetera. But to longtime residents with a lot to lose -- parking, affordable rent or property taxes, access to places of commerce and worship -- street redesign often looks like the thin end of gentrification’s pitiless wedge. What if the rents go up, driving out low-income residents? What if the rents go down, hurting property values? What if no one can park near their shops, and all the shops close? In reality, the opposite is often true. But in 2016, the fear of the unknown is occasionally still enough to motivate a broad coalition against a new bike lane. It has a real and chilling effect on bike lanes and the safety of the city’s riders. With blessings from neither the community board, nor politicians, the DOT was forced to table its Clinton Ave plan just a month after the meeting I attended. In the meantime, New York’s streets remain bloody. Five days after Leah Sylvain’s death, another cyclist was killed by a hit-and-run driver in the Bronx. Less than four weeks after that, a biker was dragged to his death by an aggressive hit-and-run driver in Williamsburg. Despite the setbacks, safe-streets advocates are cautiously optimistic about the NYC DOT’s other plans for 2016. “If [the department] can keep up the pace of what they’re doing this year, we’re going to be in pretty good shape,” mused Fried. The protected bike lane on Chrystie St, which will provide a safe approach to the 4,500 cyclists that use the Manhattan Bridge every day, passed with flying colors at a meeting of Community Board 3. Amsterdam Ave’s protected lane is finally taking shape, despite the opposition the DOT faced in Community Board 7 in early 2016. “It used to be that we’d make one step forward and two steps back,” Doug Gordon said hopefully. “I think it’s the other way around now -- two steps forward, and every once in awhile, one step back.” Each setback to the city’s redesign efforts, though, bears potentially fatal consequences for New Yorkers. Leah Sylvain is just one of 15 cyclists slain on the pavement this year so far. The death toll will climb, and nothing -- not helmet laws, repainted sharrows, or NYPD cyclist crackdowns -- will reduce it to zero as quickly as protected bike lanes. So let’s build them. Dave Infante is a producer and writer-at-large at Thrillist. Follow @dinfontay on Twitter.